I have a weakness for potato salad. Not the kind one might traditionally think of when I say this (you know, with mayo) but rather a salad that has greens but is also accompanied by a potato is some form or another. This started with the Garlic Roasted Potato, Spinach and hard boiled egg salad but soon moved into many different versions. I feel like a broken record sometimes on the subject of curry powder but if you can find one you like, it will serve many different uses in your kitchen. 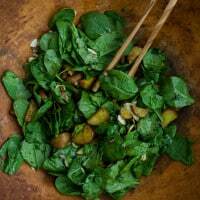 In terms of this salad, I like a mild curry powder however, I’ve also been known to throw feta into this salad, which makes me reach for the spicier version. In the fall I also envision this salad with sweet potatoes but the cute red potatoes were just calling my name. On a different note- I’m headed out to a trip to learn about Almonds and then to Minneapolis on Friday (super hooray!) Want to tag along? Be sure to follow along on Instagram! Preheat oven to 400˚ and bring a pot of water to a boil. Add sliced potatoes to the boiling water and blanch for 3-4 minutes, just until potatoes are slightly tender. Drain and place in a roasting pan along with onion. Add curry powder and coconut oil, tossing until well combined. 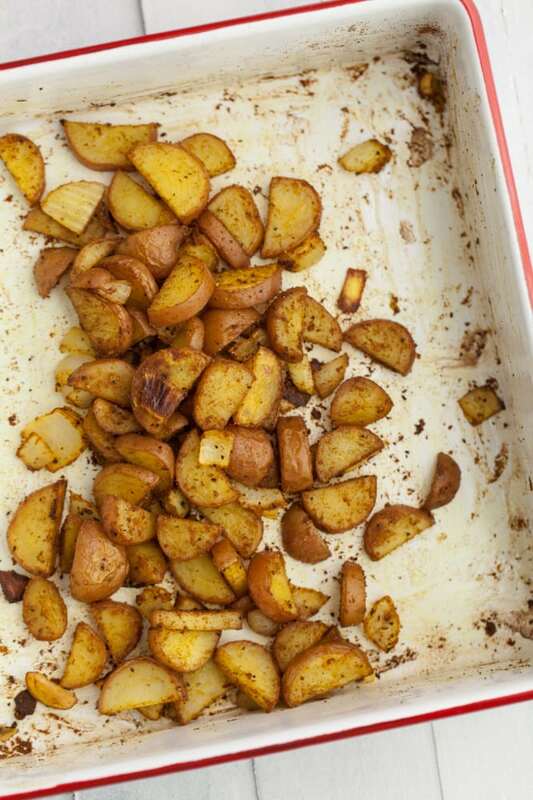 Roast potatoes until golden, 15-20 minutes. 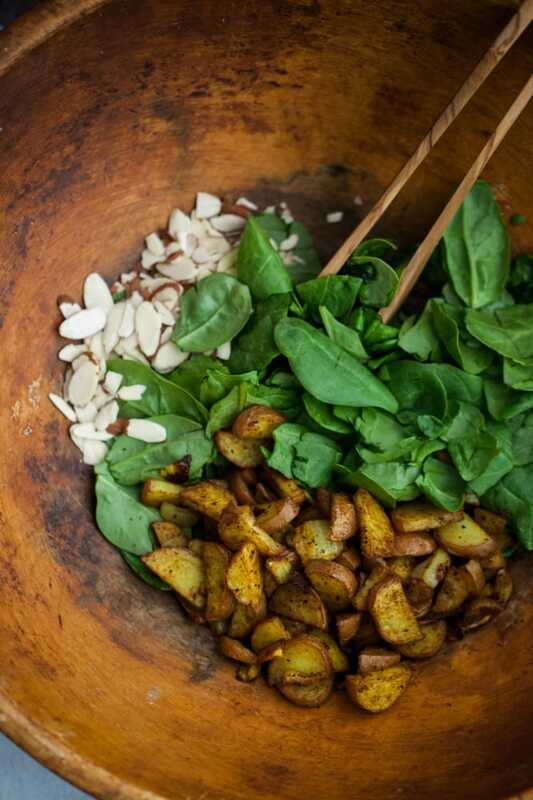 Combine roasted potatoes, spinach, and almonds in a bowl. In a small jar with lid, shake dressing together. Pour over salad and toss together. This sounds wonderful! I love curried things, but would never think to combine it into a salad…..or with potatoes actually….other than in a vegetable curry. Yum! Great recovery food too, especially the turmeric in curry powder! Oh, I’m so glad I saw this. This falls into the category of things I never ever would have thought to make on my own, but when I see it here, I know I will HAVE to make it. I love the mild curry powder from Penzeys- despite being “mild” it’s got SO much flavor. Can’t wait to try it here. Thanks for sharing! That looks so delicious! 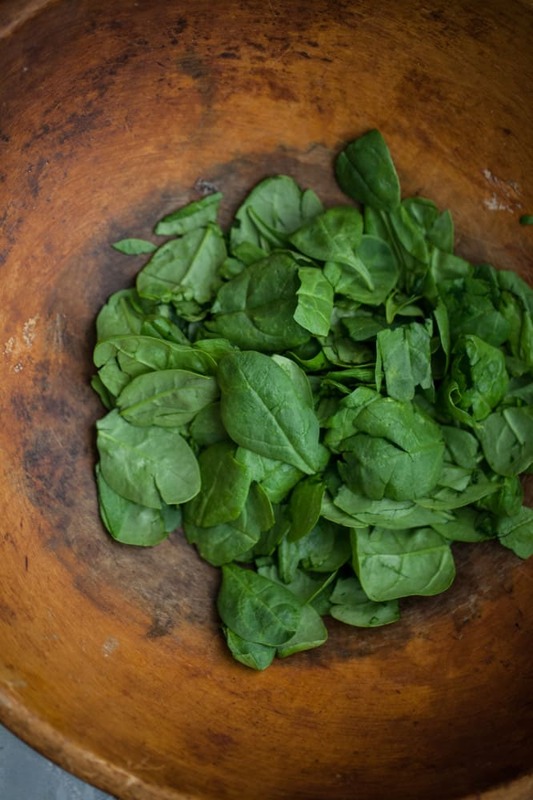 I looooove me some spinach! I love the look of this salad – it’s real, honest food. AND yummy! I recently got a vegetable box delivery and had a type of potato I’ve never had before. 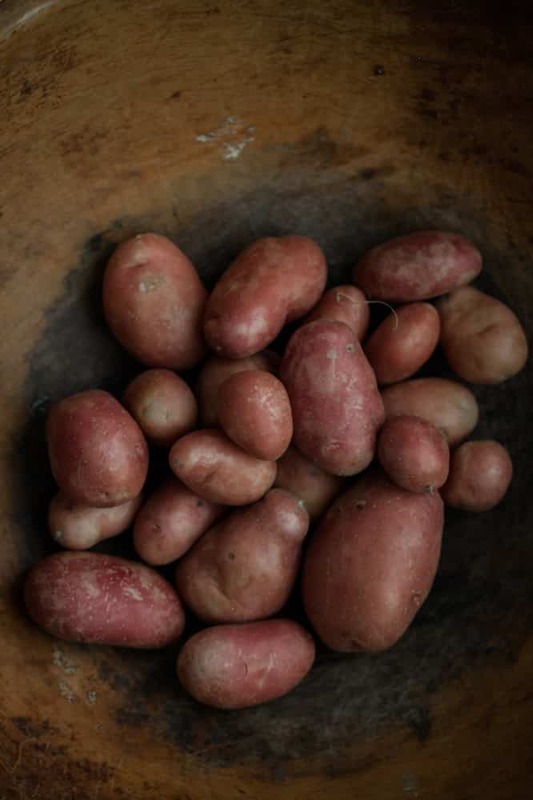 It completely turned my head, I’ve only bothered to buy the cheapest potatoes at the supermarket, thinking that they are just for bulking out or flavouring with lots of salt, pepper and other seasonings. The ones i have at the moment are so full of flavour, I boil them and can eat them on their own out the pan! i think they would work in this recipe, I can’t wait to try it. Have a great trip looking forward to seeing all your Instas! I am excited to have discovered your blog! This looks absolutely delicious and so healthy. It’s refreshing to see a potato salad that isn’t loaded with mayo! This looks absolutely delicious and simple to make (bonus)! 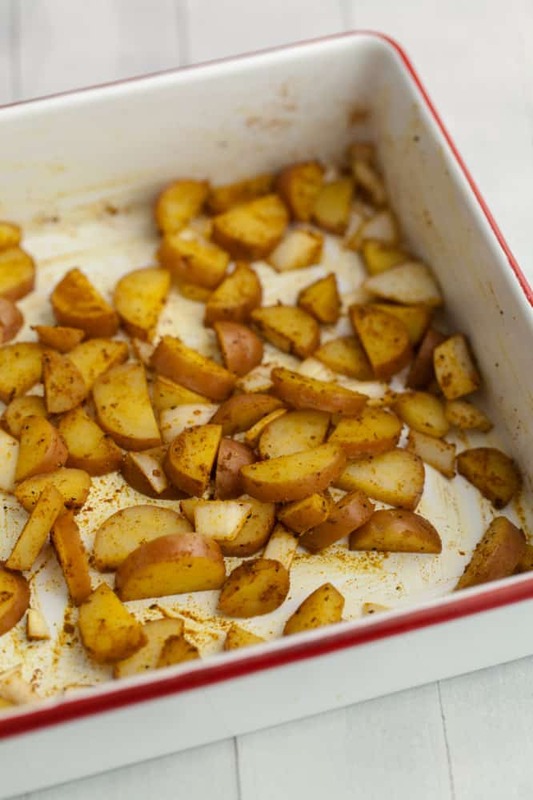 I love the idea of adding curry to the potatoes. Yum! This looks perfect on the side of some grilled chicken! Love curried anything. Perfect late summer salad! Way to put a spin on boring potato salad! Yummers! This looks simple, but so, so tasty. 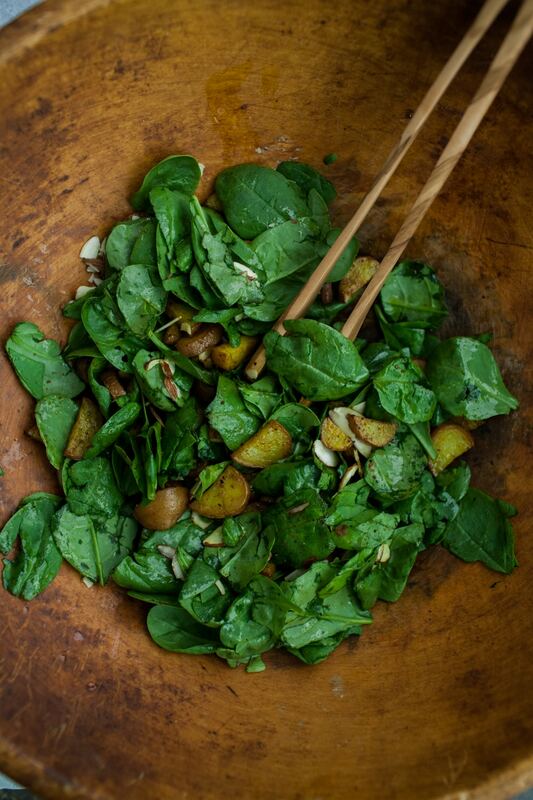 I lobe the color of the potato with the green of the spinach. I can’t wait to try this! Looks great…I’m distracted by the beautiful bowl! I need one of those in my life. Made this for dinner . Amazing flavor and so easy to prepare . Thank you for making meals so flavorful and fun to prepare! Thanks, Sally! So glad to hear it was a success! This is in the making right now. Thank you!